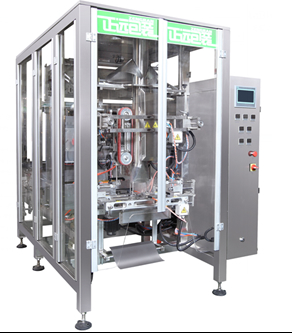 1.This machine integrates the function of bag making,filling,sealing,printing,punching and counting,has automatic offset correction function,both the transverse sealing and film pulling machanism adopt servo motor for transmission so as to guarantee high efficiency of the machine. 2.The side seal former is an independent mechanism,and has an independency offset correction system in the forming and side sealing process,which guarantee the stability of its side sealing and forming mechanism. 3.Control components all adopt well-known international brands with reliable performance;the operator can perform parameter operation on the touch screen. 4.Can make nultiple types of bags like four-side-sealed box bag,gusset bag,pillow bag,etc. 5.Can be equipped with vent valve according to material requirements. Application︰ 1.powders like milk powders,protein powder ,rice flour,coffe powder, seasoning,toner,etc.as well as granular materials like forage,coffee beans,etc.